Ride through Jurassic Park on a scenic river adventure. Watch closely as dinosaurs graze near the lagoon and pass by the totally safe raptor paddock. 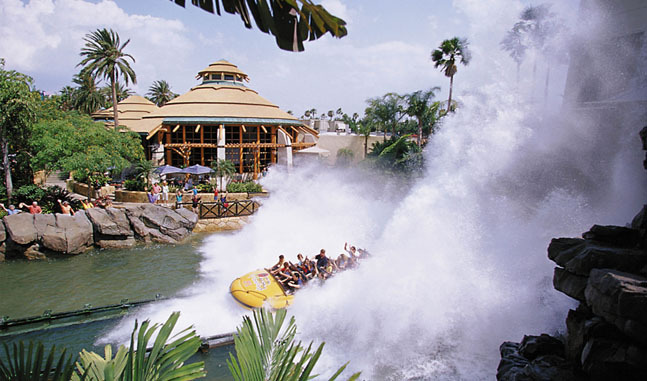 Riders are seated in a river raft and sent through Jurassic Park. The raft passes by iconic set pieces from the movie and into unknown territory. Things take a turn for the worse once assets are no longer contained. The raft then climbs inside a building while passing by raptors and eventually coming upon the king of all dinos, the T-Rex. After coming face to face with the Rex, the boat then plunges down into the lagoon below, soaking riders and spectators.